The Environmental Protection Agency faced harsh criticism at a congressional hearing Wednesday from lawmakers and activists for not taking more aggressive action to combat the spread of contaminated water in Flint, Mich., though the agency itself pointed the finger primarily at state and local officials. Lawmakers promised a whole of government response to the crisis of lead-contaminated water, calling for federal agencies to join in the state’s response to alleviating the situation and accountability for those who allowed it to unfold. Members of both parties criticized the Environmental Protection Agency for not taking a more active role once unsafe levels of lead were detected, but Democrats on the House Oversight and Government Reform Committee stressed the failure laid primarily with the state government of Michigan. Their Republican counterparts were more willing to spread the blame around. 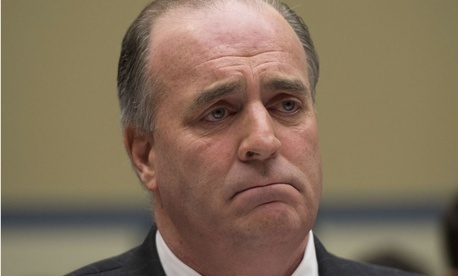 Rep. Dan Kildee, D-Mich., who represents Flint, said the EPA should have done more to make data public. But placing blame on the federal agency amounts to a “false equivalency,” he said. “I want to hold the EPA accountable,” Kildee said, “but let’s make sure we have the facts right.” He added that the state’s Environmental Quality Department lied to the EPA about having corrosion control in place. Edwards also accused EPA of retaliating against Del Toral for speaking out on Flint’s contaminated water. EPA “employees causing trouble by doing their jobs are not allowed to do their jobs,” he said. “It is a sad point in the history of the U.S. EPA that rather than being an agency Americans can count on to protect them, it has not,” O’Grady said. EPA officials said the agency is taking steps to address the crisis in a transparent way, noting officials have already deployed an EPA Flint Task Force. That group includes response personnel, scientists, water quality experts, community involvement coordinators and support staff. On Jan. 21, EPA issued an emergency order to the state and local government with specifications to bring the drinking water system in compliance with regulations. Joel Beauvais, acting Deputy Assistant Administrator at EPA's Office of Water, told the committee the agency is working on providing the first meaningful, long-term update to the Lead and Copper Rule in 25 years. Beauvais acknowledged EPA bore some culpability, but noted it was the state of Michigan that made the decision to switch Flint’s water supply to the Flint River. “Everyone should’ve done everything humanly possible to avoid this,” he said. “But I do think it’s important to remember how we got into this situation.” The EPA inspector general announced last month it would conduct an investigation into the Flint water contamination, and the agency has promised to deliver to the committee more documents related to the crisis by the end of the week. Committee Chairman Rep. Jason Chaffetz, R-Utah, assailed Beauvais for pleading ignorance instead of answering a series of questions, especially after the EPA official said he did not know why EPA “sat on” Del Toral’s initial findings for almost one year. Rep. Paul Gosar, R-Ariz., said it was “despicable” EPA Administrator Gina McCarthy did not visit Flint personally before Tuesday. He said there was plenty of blame to go around, but “some of that blame should go to the EPA, and it should go to the head honcho.” He also brought up one of EPA’s previous failures. “This is the same EPA that knew about what was going to happen in the mine blowout in Colorado,” Gosar said. Members of both parties promised to ensure proper punishment for anyone involved in the crisis. Asked after the hearing if more EPA employees should be fired, Chaffetz said some workers should potentially face jail time for falsifying records and withholding information. “I hope the Department of Justice is taking a look at it,” Chaffetz said.